This is a stub only. Please contribute to this thread and help to expand it. (I have only a few of them, I found the others in books catalogues, but could not trace an edition of them yet). This is the book everyone interested in French Tailoring should have, so I list it first. M. Darroux was the owner and manager of the Académie Internationale de Coupe de Paris (Paris International Academy of Cut), where a lot of parisian cutters and tailors were (and still are) trained. The school was established in 1830, and the first edition of the guide is from 1860. - 1860 (1st ed.) : Author : F. Ladevèze - ASIN ? - 19? (12th ed.) - ASIN ? Méthode de coupe du tailleur de Paris : Selon les principes modernisés du système Ladevèze-Darroux. For all I know, this book is still the professional reference today in Paris, on which many professional base their own method. Old editions can sometimes be found on Ebay and in old books stores. Modern editions are available to order on the Vauclair web site. 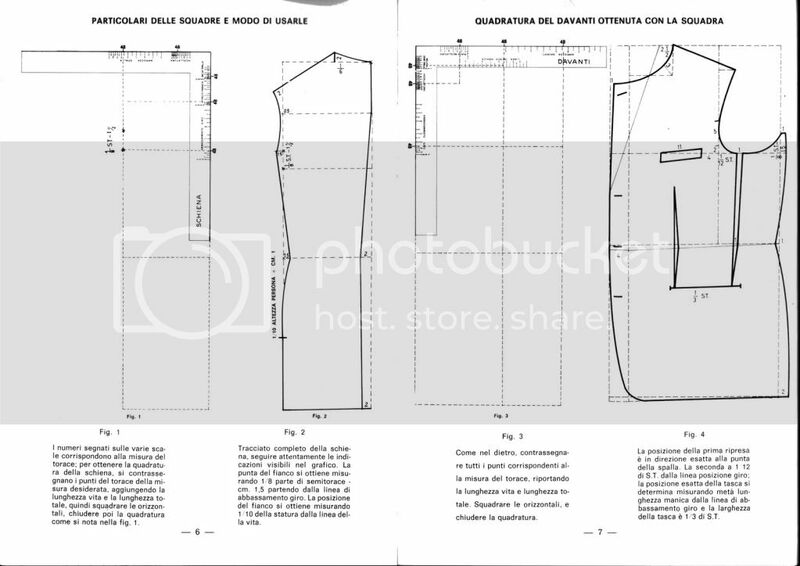 The differents measures to take, drawing the back, the side body and the front of the frock coat, patterns for the “jaquette droite” (Newmarket coat ? ), the lounge coat (SB & DB), alterations for bent & erect man, the morning coat & dress coat skirt, the overcoat, the ladies vest, the sleeve for men & ladies, the ladies coat, the vest, the trousers & breeches. This method is very practical, as it is easy to draw a pattern following it, but I could not understand the underlaying system : I found it impractical to cut anything else than the included coats, and could not use it to draw a modern lounge coat. Ed : Imprimerie typographique de Félix Malteste & Cie. Interesting book, including : body & skirt base pattern, pants pattern, modifications to different body shapes, gaiters, livery garments, clergy & law robes, uniforms, use of the body pattern to draw many coats and overcoats, and a few words about ladies tailored garments. At the end of the book, the author summers some other cutting systems used in Paris, including the Compaing method (DeVere trained under Compaing). I like this book, and used it to draft my own patterns (except for the sleeves, which are awful by today standards). I would love to find this one ! How to become a cutter in 15 minutes ! Why spend 15 years as an apprentice in Savile Row ? This book is 35000 times faster ! An interesting book about the cutting & tailoring of French garments of the XVIIth century (Louis XV period). It was included in a series of books by the Royal Academy of Science, describing the crafts of the time. Those books are only about cutting, I did not find yet a French book about tailoring, but there should be some. I've heard of the book La coupe tailleur, éditions Time-Life, from 1975, which I understood include something on how to make a coat. But I never saw it, I just found it listed on some blogs. Has an english translation which is not always 100% but easy to follow. Not sure of the date, 60's, I think. I recently got the 8th edition, which is from the 60's, looking at the fashion drawings. They do show some older drafts taken from earlier editions (slightly different way of drafting darts and shoulder lines). Wow. This is growing into quite a thread! Yes, the most intelligently written (if a bit florid) of the Italian cutting texts that I have seen. EDIT- the basic draft includes 1" provision for the "canello" (drape) on the back only and provides instructions for adding it on the front scye, if desired, without extending or altering the shoulder or waist. Manuale di taglio, volume 1 & 2 (tecnica ed estetica dell'abito femminile) by Constantino Cataldo, direttore dell'Istituto Superiore di Alta Moda Roma. Appears to be of decent quality, published in 1962. Nice book, patterns and drafting system similar to the Panaro book, but the instructions are a bit more wordy and difficult to follow. Metodo di Taglio Uomo, published by G. Guarino. Not really a drafting manual like the other ones since it uses special squares to draft a proportional pattern. The draft is based on half chest measurements, the shoulder seams are positioned to the rear. Like in the Panaro system, the maximum scye depth is 26cm. The book itself costs 65,- Euro and I paid 25,- Euro for shipping. The package gets pretty big because of the squares, although they are collapsible. Guarino runs a tailoring school, Centro internazionale moda, but despite the name I do not know if he can be contacted in English. do you know if there any good textbook on cutting and tailoring in spanish? Sorry, maybe someone else will know better. I should also say that if anyone wishes to post information on cutting in any language please feel free to post information here. Every country used to have tailor's guilds, which produced a journal for subscribing members. We need to find these old journals and cutting systems. Let's all preserve them, study them and share them!!! My name is Jorge and I'm from Argentina. Please excuse the translation and to use the google translator. I have a book entitled "Course Du Tailleur De Paris". Figure written by F. Ladevèze and is the 5th edition. Belonged to my family by my mother because they were French and dressmakers. It is in very good condition and I want to sell because no one continued this professional in the family and prefer to keep as someone who finds their usefulness and value. If there are any interested please communicate. I can trade vintage books on Spanish, looking for the Rocosa ones. PM me. I am looking for the italian book Il Taglio del sarto moderno per vestiari maschili per Rocco Aloi a 1939. I was just wondering, is the Panaro system for use ideally with the squadra rapportatore da sarto designed by Mr. Panaro? I ask because it was mentioned that the depth of scye measurement is limited to 26 cm. If not, any idea why the system has this limit? Thanks in advance for answering this question. It's not really a "limit" per se, it's a decision the author made to keep the scye depth at a limited depth rather than letting it grow further with each size/ chest width increase. That special ruler makes it probably easier to do a draft, but it's not required. The system is very simple to use, although I find that the overlap at the centre front is slightly too big and the front balance a tad too short.